As a knitwear designer and breast cancer survivor myself, this event makes me really happy! 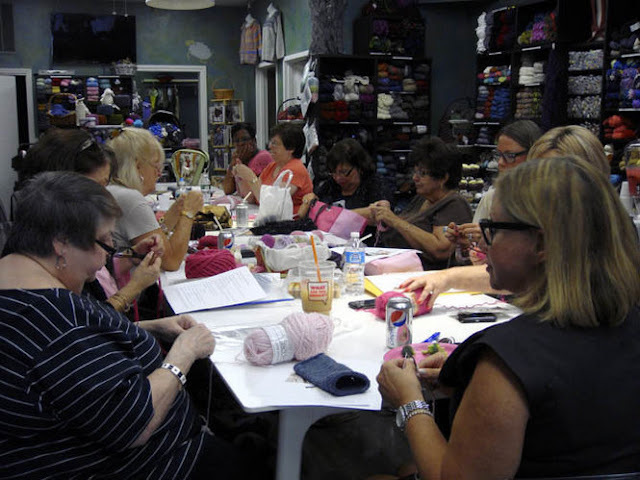 Last week in Staten Island, NY, local knitters congregated at the Naked Sheep Yarn Shop in Travis to knit special items to raise funds for the Staten Island Breast Cancer Research Initative. The items will be sold at SIBCRI's 2nd annual Breast Cancer Walkathon being held on Oct. 6th at the College of Staten Island in Willowbrook. Breast cancer is the leading cause of death among women on Staten Island. While there were definitely a lot of pink items being created, Dr. Donna Gerstle, director of the SIBRCI, says, "Not everything needs to be pink." She indicated that there are plenty of men who would probably prefer a pair of blue fingerless gloves to a pink scarf. Personally, I'm on the blue bus myself. Operation Pink, while it has got to go down as one of the all-time best branding campaigns in history, riles me up in much the same way when I can't find a pair of running sneakers with blue or yellow instead of pink or purple. I'm all for the cause, I just wish there were some alternatives.